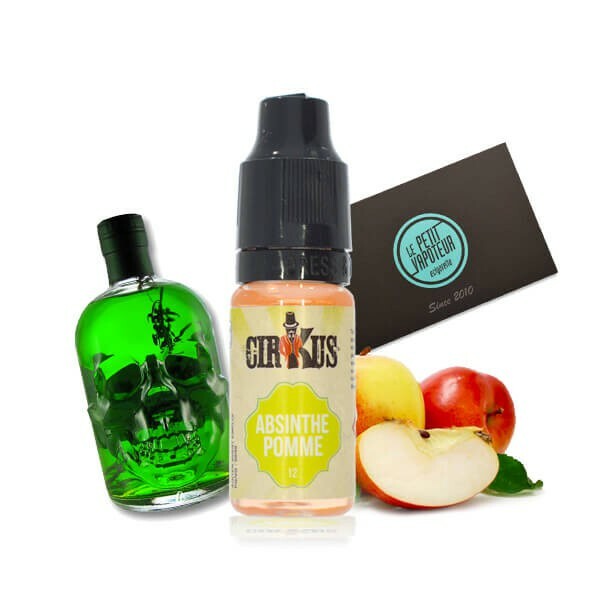 The aroma Apple Absinthe is an excellent combination of 2 complementary flavours. Aniseed, Fruity, a fresh and spicy aroma. CirKus is a French brand created and produced by VDLV located at Pessac in the Gironde. By developing CirKus, VDLV has imposed its high standards and applied its renowned expertise to offer complex and intense flavours but without any compromise concerning traceability and optimal safety. The VDLV company respects all the specific safety and hygienic regulations when producing its e-liquids to best protect consumers. Natural and synthetic food flavourings, all produced in France in conformity with our product specification sheet. They contain no sugar, oil, diacetyl, gum, GMOs or any aromatic substance known to be allergenic and which must appear on food labels by law if present. Possibly with alcohol (medium for our natural food flavourings) for the following flavours: Red Berries, Lemon Ice, the Bearded Beauty, the Gymnast and the Tamer. Possibly a pure nicotine liquid, of USP quality, extracted from tobacco leaves. Its purity and concentration are regularly analysed with our own internal analysis equipment (HPLC and gas chromatography / mass spectrometry), and compared to benchmarks provided by accredited laboratories. Authentic CirKus range e-liquids are packaged in recycled polyethylene terephthalate (PET1) 10 ml plastic bottles (bisphenol free) and fitted with a dropper, a tamper-proof ring and a childproof plug. In accordance with European legislation, each bottle has an individual label with relevant graphics, and stating the intended use and the name of the flavouring, the composition of the e-liquid, the nicotine content, the name and address of the company, the best before date and the lot number. For nicotine e-liquids, regulatory hazard pictograms, risk and safety phrases as well as a Braille "Warning" triangle for visually-challenged persons are displayed on the bottle. 0 mg/ml, 6 mg/ml, 12 mg/ml, 16 mg/ml. The correct dosage depends on your nicotine dependence. 16 mg for heavy dependence. 12 mg for average dependence. 6 mg for low dependence. Do the test to give yourself an idea. For optimal preservation of flavours, keep your CirKus e-liquid away from the light, in a dry place and at an ambient temperature of around 20°C. Systematic laboratory analyses of nicotine bases from the moment of production, carried out internally using HPLC chromatography and comparing the results with benchmark formulations. Regular checks of nicotine content of our e-liquids. Regular microbiological analyses of e-liquid samples by COFRAC, an accredited laboratory (accreditation n°1-0797). Thanks to an information system that lets us pilot and manage the production in real time during the whole production process, VDLV guarantees complete traceability for 100% of its products. Each e-liquid bottle has a lot number that lets us trace its quality at each step of the production process. VDLV providers supply the company with raw materials, including nicotine of USP quality, propylene glycol and vegetable glycerine of PE (European Pharmacopeia) quality, as well as food flavourings produced exclusively in France and conform to our product specification sheets and European Standards in effect. CirKus e-liquid is compatible with all brands of electronic cigarette. Odeur anisé herbacée, goût anisé (évidemment) présence très nette du fruit. Peu sucré, très agréable.